Chitralekha Patnaik – Chitralekha Odissi Dance Creation Inc.
Chitralekha Patnaik is an outstanding proponent of the Odissi Nrutya. She learned from the most esteemed fathers of the Odissi discipline: (late) Padmashri Pankaj Charan Das, (late) Padmabibhushan Kelucharan Mohapatra, (late) Guru Sri Debaprasad Das, (late) Guru Sri Mahadev Rout, and (late) Guru Sri Battakrushna Sena. In 1955 she graduated from the Kalamandir Dance Institute of Cuttack, Orissa. She holds a Bachelor of Arts Degree from the National Music Association of Cuttack, Orissa and a Bachelor's Degree in Sanskrit and Economics from Utkal University. 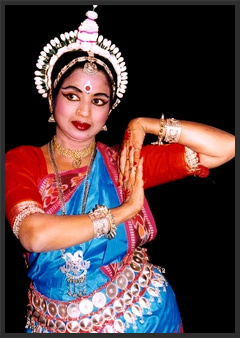 She began performing widely across North America in 1972, and has been teaching Odissi dance since 1975. In 1980 she founded the Chitralekha Dance Academy to expound and propagate Odissi to a new generation of artists. She has choreographed many original works within the traditional discipline, as well as semi-classical, and various other farmaish items from different parts of India. She was awarded Kalashri by the Orissa Society of the Americas in 1992. In 1994, she co-founded Chitralekha Odissi Dance Creations with Ellora and Devraj Patnaik. Chitralekha believes strongly in the interconnectedness of life and art, and intends to teach, perform and promote Odissi Dance for the rest of her life.